Air is separated in large chemical plants, where impurities are removed. This is normally done by either Pressure Swing Adsorption (PSA) or Temperature Swing Adsorption (TSA). The filtered air is then pressurised to around 40 bar. It is then chilled in a distillation column where the air is separated into its component parts using a packed column, in which the nitrogen moves to the top of the column, then the argon to the side and oxygen to the bottom. Air Products process the separated air and supply a wide range of industries and businesses. Because of the vast applications of their ‘air products’ they have a very varied range of clients; from refineries to schools and garages to restaurants. Jama told me about some of the direct uses of air products, some common and some a bit more unusual! Separated air is big business in the food industry, for example in food packaging and freezing. When meat is packed into plastic packaging, the oxygen is removed and then the package is pressurised using inert separated gases. This technique is called MAP (Modified Atmosphere Packaging), which aims to extend shelf-life and is discussed in my earlier blog ‘Put a label on it to reduce food waste’. Liquid nitrogen is also used by food producers to help preserve food. For example it can be used to flash-freeze meat to low temperatures (eg -197 oC). This not only improves shelf-life, but also preserves the meat quality as it reduces the formation of ice crystals. Jama also told me that liquid nitrogen is used to flash-freeze extravagant wedding cakes! He says that using liquid nitrogen helps the cakes keep their complex structures. Another application of air products is the use of oxygen, instead of air, in furnaces for metal production. Oxygen can be used to maximise the efficiency in cement manufacture and steel production, meaning less fuel is used so any large equipment could be made smaller. 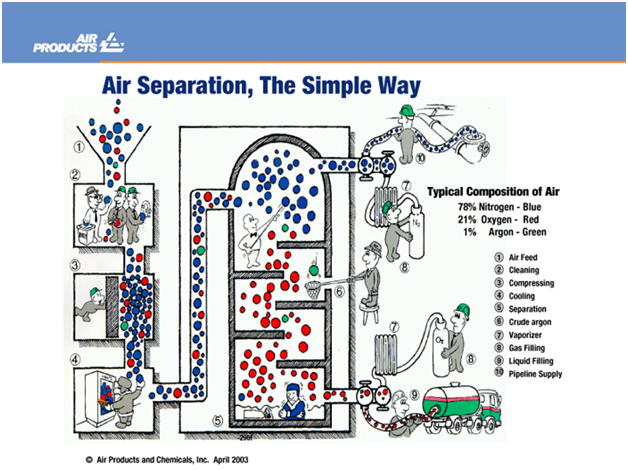 Air separation is also important in healthcare. Think of the cylinders of gas used for people who need oxygen; this gas is produced using separation technology. Liquid helium, separated from air, is used to cool down the super-conductive magnets in MRI machines. The electromagnetic coil could get very hot and liquid helium is the air product cold enough to cool this. Jama is correct in saying that this is a really interesting and fun field for chemical engineers. The wide variety of applications this technology offers are a breath of fresh air! This is another great example of how chemical engineering matters. The uses and problems of gases separated from air can interesting. Many people have fun with both liquid nitrogen and helium not realising how dangerous they are. They are both asphyxiants and it can only take 30 seconds to clear enough oxygen from one’s lungs to cause a blackout that quickly leads to death. We breath these gases all our life but without oxygen we are dead. Interestingly the German word for nitrogen is stickstoff which means asphyxiant stuff.